Bangalore Home Page - GGI-Group size: 4000+ Professionals, Increasing on day to day basis, Come & join us 2 serve Mother Nature. 1) The Sl.No assigned below r not to show any order in which u need to contact hence u can call any POC. Subpages (18): 02Oct10- Cycle Rally on Gandhi Jayanthi 4 Love & Peace Confirmation Form Bangalore Past Event Snap shot's & Ride details Bangalore Point Of Contact (POC) Bike4Sale Biker Friendly Places in Bangalore Go Green & BSA Cyclothon Registration confirmation sheet. 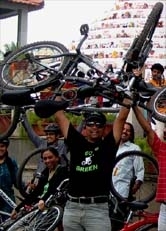 Go Green Group supporting BSA Cyclothon - 2011 [ ] Go Green Initiator's Bike Lending Program. 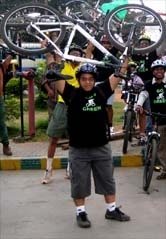 GoGreen's endurance ride towards Chikka Tirupathi 25Dec11 GoGreen's Independence Ride on this 15Aug2011, GoGreen Supporting ZED habbit's Cycling Event on 21Aug2011 & their after a rally 2 support Anna HERCULES CITY CHALLENGE Bengaluru ‘11 Oppppps .... Sorry, You can Check our home page & see the updates.. Profile Registration form for Columbia Asia Cyclothon This Month's Endurance Ride details.. 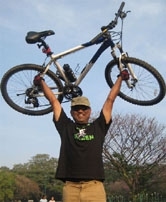 This month's Endurance Ride towards Big Banyan tree base : 31 July 2011 Welcome 2 the GoGreen Family, A Family that's trying to work hard to Stop Global Warming..